For children, the world is a magical and curious place. They learn by mirroring Mommy and Daddy, with the ultimate goal of being able to "do it myself" and feel like an active member of the family. That's why Little Partners created the Learning Tower Limited Edition. Like the original Learning Tower, this edition has been designed to provide a secure environment for a child's imagination to be stimulated and to blossom. It nurtures a child's innate desire to be independent and participate alongside his or her parents and siblings. Little Partners believes a child's learning and development can be fun. We've created educational products that inspire, delight, and engage children's interest in learning and also promote child-parent interaction. Gift your baby the Learning Tower Limited Edition today and watch him explore new heights! HIGH QUALITY - Little Partners Learning Tower has a sturdy wooden construction. It is made from layered hardwood-birch and poplar-and has been carefully coated with durable, non-toxic wood finish that can be cleaned easily. Simply wipe it with a damp cloth. 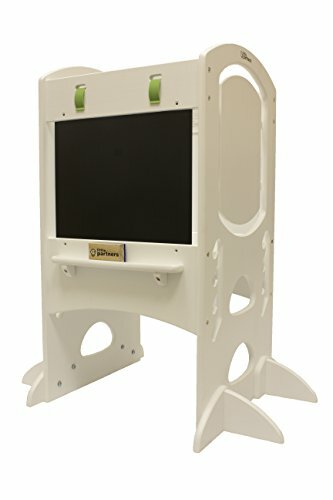 MAXIMUM SUPPORT - This platform height adjusts quickly and easily to the needs of children from 18 months to 6 years old. It also features a wide platform (15″ × 18″) so that your little helper will not slip off a step when climbing up. The four-sided railings provide additional support so that your child won't fall when inside. PARENT-CHILD BONDING - Does your tiny tot love to help in the kitchen? Then the Learning Tower is the ideal gift for them. It fits flush against counters so toddlers can safely climb up to see what's happening on the countertop or help prepare the meal. It's also a great tool for teaching kids how to wash the dishes and brush their teeth independently. TOP RATED STEP STOOL - From the People who brought you the Original Learning tower, the Little Partners Learning Tower is the only step stool on the market designed to meet the specific needs of toddlers 18 months and older. It has removable side panels so parents can choose how much enclosure to use. It also has an activity center with a chalkboard, paperclip holders, and a shelf to store your child's belongings for easy access. Your child can scribble, draw, and paint with the activity center. SAFETY STANDARDS - This step stool is tested to hold up to 500 pounds. It has safety railings to prevent accidental falls. It meets the safety standards of the American Society for Testing and Materials (ASTM [F96-30]) and Home Playground Equipment (F11-48-98C).